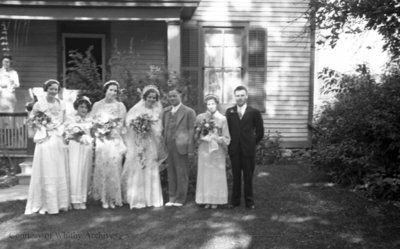 A black and white negative of Mr. and Mrs. Powell and their wedding party. In this view Mrs. Powell has 3 women holding bouquets standing on her right and Mr. Powell has a woman holding a bouquet and a man standing on his left. Powell Wedding, c.1935, Marjorie Ruddy. Whitby Archives A2013_040_179D.